Four-anchor, two-level, totally-average regional enclosed shopping mall of the early-’70s, which thrived until the turn of the millennium. 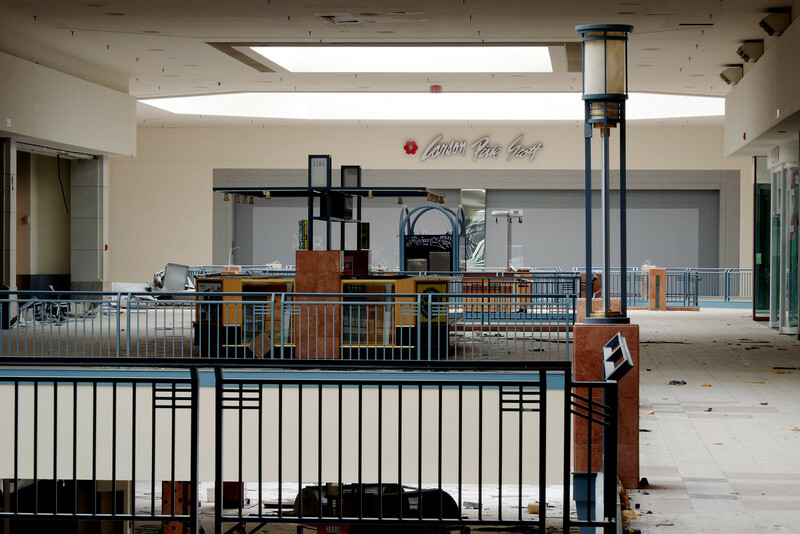 Hurt by the loss of two anchors within a year of each other; things got even worse when a revitalization effort collapsed amid the late-2000s economic crisis – leaving areas of the mall in ruin from partial-demolition that was never repaired. The mall operated like so until 2015, when a county judge finally ordered it (save for its only surviving anchor) closed due to dangerous conditions. Vandals destroyed the interior after a media whore squawked to WGN in late-2016, and the demolition orders were finally given the next spring. Loot: two overflowing shopping carts worth of construction and renovation plans (including those for the botched remodel), signs, displays, a mall tablecloth, a mall directory circa-2004, PR material, kittens (no, seriously), and lots of other crap I can’t discuss yet.